At Taye Drums, we are dedicated to making great sounding drums. In our vision, no detail is small enough if it results in a better drum.Taye Drums was founded in 1975 with the sole purpose of crafting instruments that are an extension of your art and originality. Taye started off as a company that supplied superior quality hardware and drums to many of the world’s most famous brands. 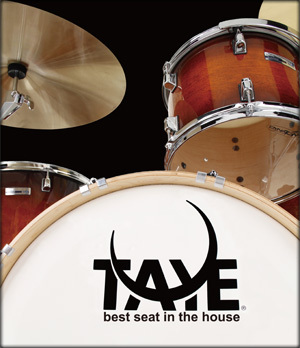 After several years it became evident that it was necessary to offer Taye innovations and design ideas to all drummers seeking practical solutions to seemingly complex issues that interfere with the ability to create and perform.Complete attention to detail and playability is incorporated into every Taye drumset, from student level to ultra-professional. What’s more, unlike many other instruments, every component is entirely made by Taye. This gives you the assurance of incomparable quality control and serviceability of every instrument and accessory we create.So what are you waiting for? Taye Drums . . . best seat in the house. World-wide export to drummers and dealers! 25 years in business!